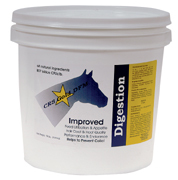 CRS GOLD Probiotics and Prebiotics include beneficial bacteria that work in the digestive tract in order for the animal to process feedstuffs for absorption. Our product contains 807 BILLION CFU's(50.4 Billion per ounce), AND 8 ENZYMES are available as well, for a whole body approach for health. These digestive enzymes work with gastric juices to start the breakdown of feed, then the beneficial bacteria make the feed more readily absorbable. There is a microbial balance that needs to be maintained throughout the animal's digestive tract. Unfortunately, the microflora and microbial balance can be upset faster than it can be restored. When the beneficial intestinal bacteria is destroyed or depleted (ex: stress, training, travel, worming or with the use of antibotics) the pH of the intestinal environment is also altered. This altered state can affect digestion, health and well-being (for instance, this altered state increases the chance of Colic and Ulcers!) When beneficial, diverse microbes are added, overall wellness is increased. This is Beneficial for senior horses as well. CRS GOLD DFM is "micro-encapsulated" to allow the beneficial "PRO"biotics the opportunity to colonize in the digestive sites as needed fighting against disturbances and boosting the immune system. This micro-encapsulating process also causes the bacteria to withstand the high temperatures needed for mixing with feed (up to 200 degrees F). As CRS GOLD travels through the digestive tract it is programed to release (become active) at the proper time as necessary for absorption. 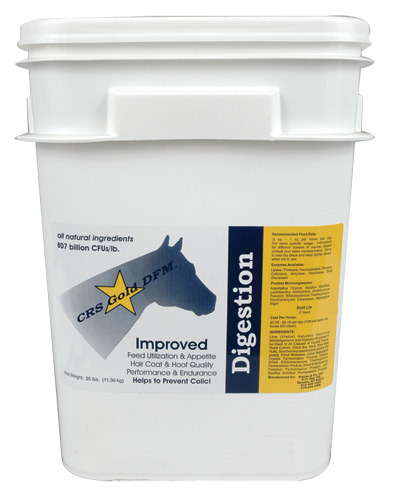 CRS GOLD DFM also neutralizes pH and therefore helps to prevent and treat Ulcers! By helping to keep the digestive tract working correctly, the risk of Colic (and "Leaky Gut")is greatly reduced! This nutritional support improves your animal's immune system and often helps to save money on your feed bill at the same time (since feedstuffs are more efficiently digested) as you feed CRS GOLD on a regular basis. Thank you for considering CRS GOLD DFM as a vital part of your daily feeding program! We believe that we have the very BEST probiotic on the market for pennies a day as compared to others that cost dollars per day. In a recent university study CRS GOLD out performed 10 of the top probiotic products on the market in viability and ingredients. Available in 10#, 25# pails from vendors listed and vets around the country. Ask your vet to carry our product! We also have canine and feline probiotics available. Before and after pictures are on the following page. 10 # size has 320 servings! 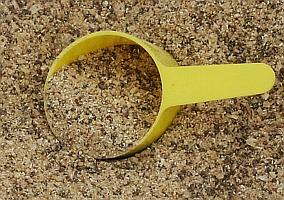 1/2 ounce scoop is included!